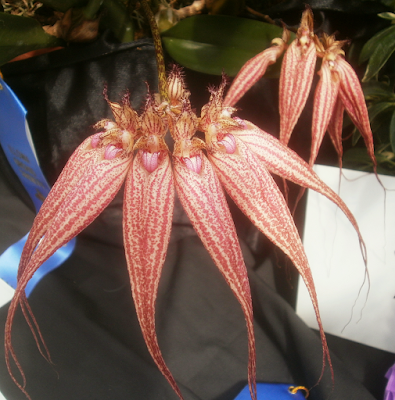 We just did a Bulbophyllum, I know, but this one looks so different I feel like it shouldn't count as a repeat. To put it in misleadingly oversimplified terms, it looks sort of like B. longissimum is long but light-colored, and B. rothschildianum is stumpy but colorful, and Elizabeth Ann 'Buckleberry' got the length from one parent and the color from the other. When I looked into the ancestry, I was surprised to learn that B. putidum (previously, in 2014) wasn't in the mix somewhere, because they seem pretty similar in color. Apparently not, though. It did get me wondering how often orchid breeders wind up making hybrids that more or less duplicate a natural species. Surely that's happened at least once, right?